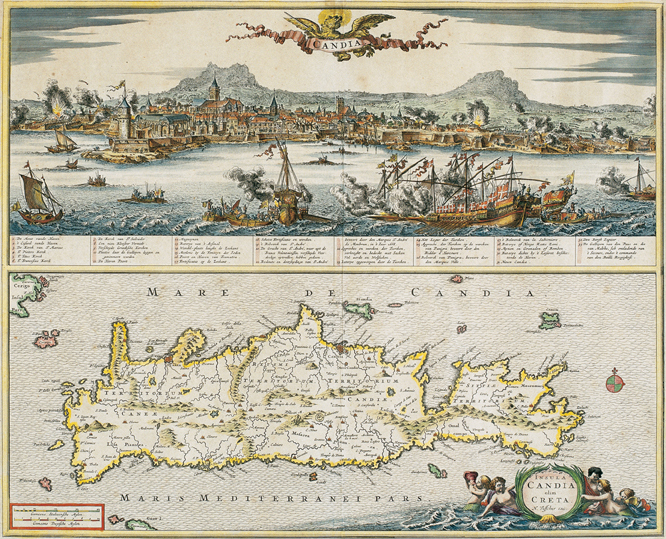 CM: This is a beautiful and well-known map of the Island of Crete prepared by Nicolaas Visscher. The upper zone represents the Turkish siege of Candia, the island's capital city, with a key-guide in numerals. The title appears on a banner brandished by a winged lion. The lower zone gives the map of Crete. At the lower right is a vignet giving the title and the cartographer's name. Visscher's Map of Crete is a richly engraved work, one of the most beautiful ever produced maps of this island.